They love him. The Latin American people love Xi Jinping, not so much because of his charisma as for what he stands for. He represents a great civilization which considers harmony its supreme value. Heaven and Man are one -- all men are brothers. China has the fastest growing economy. The Chinese are working to realize their Chinese Dream. They also want to help others grow. Their slogan is "common growth." They absolutely reject the zero-sum game and pledge to work for win-win results. To achieve that purpose, they need a peaceful environment and a fair and just world order. So their motto is: peace, development, civilization and innovation. Take the proposed BRICS development bank for example. It is designed to help BRICS members and the developing world. It was called for partly because the World Bank and IMF refuse to give a greater (fairer) voice to the developing world. But the BRICS bank will supplement, and not act as a substitute for the World Bank or IMF. China's priority is to help the developing world. But its large and fast growing economy is helping contribute to world growth. It is helping the EU, the largest economy in the world, overcome its sovereign debt problem. It is also the biggest creditor of the world hegemon, the United States. Its principle is mutual benefit and cooperation. Xi attended the BRICS summit in Brazil and met with many Latin American leaders. He visited four Latin American countries: Brazil, Argentina, Venezuela and Cuba, and made all of them comprehensive strategic partners of China, which means they will cooperate in every sphere for mutual benefit. Some Western analysts have belittled the BRICS, claiming there is precious little similarity among them. But they are all (with the exception of Russia, perhaps) emerging market economies. Their differences are exactly why they can develop their comparative advantages and complement each other. Xi, in his speech delivered at the 6th BRICS summit, expounded the principle of inclusiveness, accommodation of different social systems, cultural traditions and development models, so as to set an exemplary model of international democracy. It is puzzling to say the least to belittle the BRICS. Russia is a significant energy and military power. India, the second most populous country in the world, ranks tenth in terms of nominal GDP. But its economy is the third largest in the world in terms of purchasing power parity (PPP). Brazil is the largest country in Latin America, and its economy ranks seventh in the world. It has just successfully hosted the World Cup, in spite of some dire predictions in the West. Some in the West still cast China as a "regional power." The way Xi swept through Latin America says otherwise. Chinese made state of the art trains that have just entered operation in Buenos Aires, representing a "qualitative leap" in the city's transportation system. The modern apartment complex China helped build in Venezuela is now serving local families. When Xi was in Brazil, China signed 56 cooperation documents with Brazil, including cooperation agreements in space technology such as remote sensing. 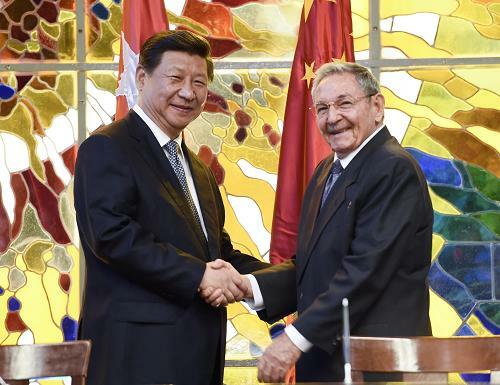 What is especially notable is that Xi paid respect to Latin American heroes Simon Bolivar, Hugo Chavez and the living Cuban hero Fidel Castro. These are men who fought for freedom. Triangulation between China, Latin America and the US? Should the US worry about BRICS? They love him. The Latin American people love Xi Jinping, not so much because of his charisma as for what he stands for.